If you’re old enough to remember the 1970’s then we imagine you’ll be familiar with discos, sequined outfits, massive collars and platform shoes. 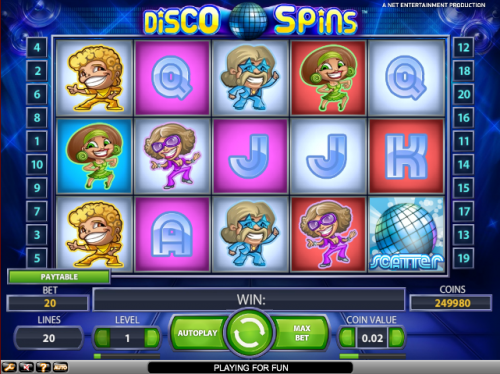 There was an explosion of disco music and groovy dance moves and if all that appeals then perhaps Disco Spins is the online slot machine for you; it’s one of the latest releases from Net Entertainment and it’s a funky little number which packs a lot of entertainment into a small package. Everything about the environment is designed to recreate the atmosphere of a 1970s discotheque; a lush blue background provides the backdrop and the symbols are a range of dancing figures differentiated by their coloured outfits – blue, yellow, red, green and purple – as well as the usual 10, J, Q, K and A. Appropriately the scatter symbol is a disco ball. What you’ll notice when you play Disco Spins is the way the reels look like floor tiles. These tiles constantly change colour when the reels are spinning but when they stop, if the colour matches the dancer who lands on it the character turns into a wild. Wilds substitute for other symbols to make winning combinations. Because of the way the floor tiles are organised you’ll often find you land two wilds on the same reel, doubling your potential winnings. The fantastic mirror ball scatter symbol is the gateway to the bonus features. Scatters are only available on reels 3, 4 and 5 and if you spin three you’ll get a choice of Free Spins or Disco Spins. The Free Spins feature gives you fifteen spins with a 3x multiplier and the opportunity to get more free spins by landing more scatter symbols. 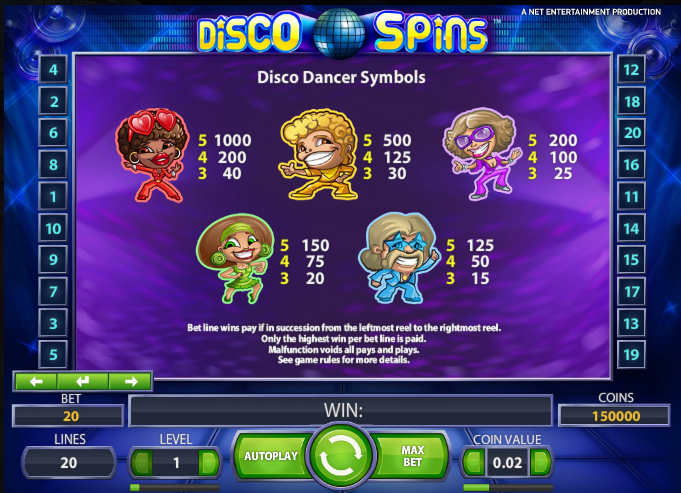 If you select Disco Spins you’ll only get ten free spins but the reels will only contain dancers and scatter symbols, increasing your chances of winning combinations. Again, two or more scatter symbols will give you additional free spins. We like Disco Spins; the characters are cute, the music is funky and the bonus features are well designed. It has five reels and twenty fixed paylines which, depending on your settings and budget, will cost between €0.20 and €200 per spin.